After that huge, ornate no-solder compass pendant, I felt like doing something in the opposite direction last night--something smallish and simple, very glossy, involving soldering. So I put this together from some bits I had lying around the bench. Maybe it would be good for someone with a more minimalist-leaning love of steampunk at ISC. 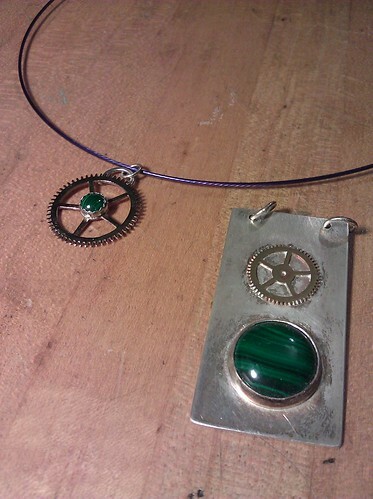 I made that pendant on the right during the same class where I made my Hello World ring. The intensive weekend introduction to metalsmithing I took at CCAE in the summer of 2009 was really the start of all this. 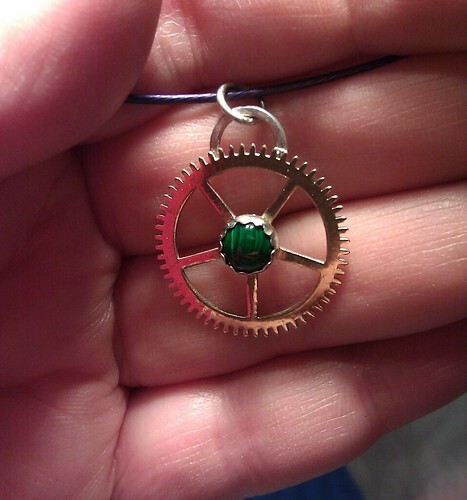 Seeing that it was possible to solder gears onto metal was pretty exciting! But unlike my Hello World ring, this pendant isn't something I wear proudly to remember the start of my metalsmithing adventures--it neither feels like something that goes with my current wardrobe, nor like a good representative of my techniques. I'm probably going to take it apart and recycle the silver, so I thought I'd take this picture and write a bit about it in order to have a record of my second-ever piece of metalsmithing. Squee, malachite! I adore malachite! @melitiel Neat! I don't think of it as a "gemstone" because it's opaque and not sparkly, so sometimes I wonder how much people like it--it's good to know it has its fans as well!